Organisations should take a closer look at their design principles when planning and refurbishing disability equipment in their premises. There are many simple installations and fixtures that you could incorporate. These additions will not only make the lives of some of your current customers easier but will also attract more. Ask yourself: does my space look warm and inviting to all potential customers? Do you consider global values such as diversity and inclusion in your premises and what thought have you given to disability equipment? A seemingly ordinary fixture such a disability hand basin can speak volumes about how you value your employees, your customers and the community you serve. One major principle of responsible design is prioritising the placement and installation of facilities and features that can provide access for people with disabilities or mobility issues. To help people in New Zealand be more responsible with their design decisions, the government, through the Ministry of Social Development submitted a report titled Economic Effects of Utilising Lifemark at a National Level. The initiative aims to provide guidelines for building homes that answer to the changing needs of the ageing population and people with disability throughout their lifetime. Some of the key living features include: generous room and entry spaces, easy mobility in and around, capability for easy and cost-effective adaptation and flexibility to anticipate and meet the changing needs of the occupants. If you look closer at these design principles advocated by Lifemark, you would find that they are applicable not only for the ageing population, disabled occupants and people with mobility issues, but also for anyone wanting to enjoy sustainable, convenient and safe living at home. These principles can also be applied by businesses that want to be responsible for the comfort and safety of their staff and customers. 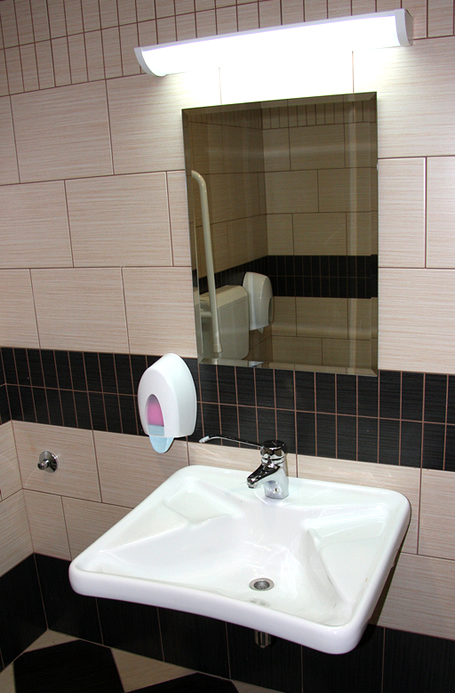 By investing in disability equipment like a hand basin, you are opening up your business to more disabled employees and customers. Studies show that disabled employees and those with mobility issues are proven to be more reliable, loyal and have lower accident rates compared to the general workforce with the same skill set. In NZ, 99.78% is the accident safety rate for disabled people in the workplace. (Brake, 2001; ILO, 2003; Perry, et al, 2000). Their challenges in mobility and living have sharpened their practical problem solving skills that can be applicable in the workplace. Companies looking for talent can invest in disability-friendly facilities like hand basins as a way to attract a new skills pool. Another business value of disabled-friendly spaces is having the opportunity to serve the disabled market. A large number of disabled people in New Zealand have disposable income. Expanding your market is always a way to boost business growth and profit, but profiting within a responsible framework is what will set your brand apart from your competition. The steps taken by the government to make certain the adoption of universal design ensures that Kiwis are moving towards a society that is capable of adapting to the changing social and economic conditions. The move to modify spaces and provide disabled people and people with mobility issues with the proper and useful facilities and equipment enhances not only their lives but also the lives of the people surrounding them. This does not only relate to one aspect of their lives but encompasses both personal and social relations. Consequently, the benefit is not only towards the disabled, their family and their close relations but also in totality, towards society.